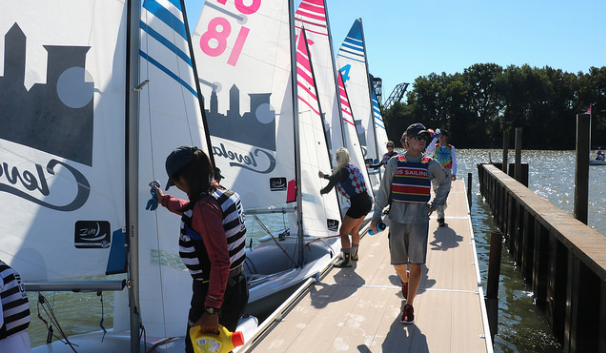 CLEVELAND, Ohio (September 30, 2018) – Cleveland’s revamped and re-energized waterfront was fully realized this weekend, and the sport of sailing, team racing to be specific, was the featured attraction. The 2018 U.S. Team Racing Championship for the historic George R. Hinman Trophy, hosted by The Foundry, Cleveland’s Community Rowing and Sailing Center, came to an exciting finish on Sunday after three days of intense competition in Cleveland Harbor and Lake Erie. The winning team, Boss, composed of mostly Hobart and William Smith Colleges alumni sailors stole the show on Sunday to capture the elusive Hinman Trophy. Boss featured Greiner Hobbs (Terra Ceira, Fla.) and Miranda Bakos (Beverly, Mass. ); Brian Clancy (Ithaca, N.Y.) and Catherine Riedman (Conshohocken, Pa.); and Johnny Norfleet (New York, N.Y.) and Chris Klevin (Westerly, R.I.). The three skippers, Clancy, Norfleet, and Hobbs are Hobart and William Smith alumni. Clancy is now the head coach at Cornell, Norfleet is the head coach at Fordham, and Hobbs was a finalist for the ICSA Sailor of the Year award in 2018. Boss last raced for the Hinman in 2016 where they placed third. Boss sealed the title on Sunday afternoon with a thrilling 3-2 win over a team representing the College of Charleston in the Final Series. Boss jumped out to a quick 2-0 lead in the best of five series. The College of Charleston bounced back to win the next two matches to force a decisive fifth and final match to determine the winner. Despite lessening sailing conditions and oscillating winds in the afternoon, Boss pulled through in the end to capture their first Hinman Trophy. Boss and College of Charleston went head-to-head eight times this weekend with Boss going 5-3, including 2-1 in the Round Robin and Gold fleet races. As the #3 seed entering the Semifinal Knock-out stage, Boss reached the Finals by defeating #4 Aquadisiacs, 3-1. They were perfect against Aquadisiacs in the previous rounds, 2-1. College of Charleston was the #1 seed entering the Semifinal round and they selected #2 Jet Lag as their opponent. Jet Lag, the defending champion from 2017, was knocked-out, 3-2, after leading, 2-1. College of Charleston was 3-0 against Jet Lag in Round Robin play. Placing second overall was the College of Charleston and they are composed of Augie Dale (Pewaukee, Wis.) and Katie Lounsbury (Charleston, S.C.); Christophe Killian (Newport Beach, Calif.) and Elizabeth Pemberton (Osterville, Mass. ); and Stefano Peschiera (Lima, Peru) and Grace McCarthy (San Diego, Calif.). Aquadisiacs beat Jet Lag in the Petit Finals for third place, 2-0. The sailors representing Aquadisiacs includes Conner Harding (Naples, Fla.) and Mike McBrien (East Patchogue, N.Y.); Martim Anderson (Bristol, R.I.) and Marina Cano Sostre (Boston, Mass. ); Mackenzie Bryan (Cos Cob, Conn.) and Jennifer Agell (Orient, N.Y.). Jet Lag’s team is composed of skippers Mateo Vargas (San Francisco, Calif.), Oliver Toole (Menlo Park, Calif.) and Kevin Laube (San Francisco, Calif.) and crew Samantha Steele (San Francisco, Calif.), Carolyn Kelly Ortel (Menlo Park, Calif.) and Yuri Namikawa (San Francisco, Calif.). Sunday’s racing featured stable 8 to 10 knots with gusts up to 15, and flat water for most of the day. However, the breeze was shifty. The breeze was blowing in over the land masses in the area making it difficult to read on the water. The pressure was down at the bottom of the course and up at the top marks. Friday’s racing was set up nicely with cooperating wind directions from the south, southwest. The start line was organized about 100 yards offshore. Breeze ranged from 8 to 15 knots on mostly calm waters. The 12 teams tallied 132 races through the Round Robin 1 and 2 stages, and 77 races on Friday alone. Saturday’s racing included a similar number of races after finishing the Round Robin 2 stage and nearly all of the Gold and Silver fleet races. Teams raced in less predictable conditions with fluctuating wind direction and speed (10 to 12 knots, gusts up to 15). The breeze shifted considerably throughout the day, especially in the afternoon. The top six teams from the Round Robin stages advanced to the Gold Fleet, while the bottom six moved on to the Silver Fleet. Wins in the Gold Fleet were worth 1.5 points and the wins in the Silver Fleet were valued at 1 point. The top four teams with the most points from the two fleets advanced to the Semifinals. Points carried over from the Round Robin stages to the Gold and Silver fleet round. Teams with exceptional boat handling, foot work in the boat, and overall speed faired well in the shifty conditions. First held in 1981, the U.S. Team Racing Championship remains one of the hottest events in the country. This year’s Championship features an impressive list of accomplished teams and experienced team racers, many of whom have competed in and won this Championship in years past. From top-notch one-design sailors in fleet racing circles to current and former high-level college sailors and coaches, this US Sailing National Championship attracts a wide range of sailors, both men and women. This year’s entry list featured active college sailors, coaches and alumni from major programs including, Old Dominion, College of Charleston, Stanford, Roger Williams, Yale, Brown, Virginia, Dartmouth, Hobart and William Smith, and others. Jet Lag, composed of Stanford alumni, returned all six of their sailors from last year’s team that won the title in Oyster Bay, N.Y. This premier team racing event in the United States is an invitational event. Interested teams applied by resume and international teams are invited to compete. The Championship is raced in three-boat/six-person teams (three skippers and three crews). Teams raced the 420E from Zim Sailing. The 420E features enclosed deck technology ideal for high school and college sailing. Team racing is one of the most popular disciplines in sailing. Over 100 races can be sailed in just a few days. Races, or flights, are shorter than traditional race courses and are raced on a “Digital N” course. Three flights can race simultaneously with teams swapping out after each race with each team wearing a unique identifying pinny or bib. The regatta was initiated by Sailing World magazine, and after years of growth and popularity, the event was adopted by US Sailing and became known as the U.S. Team Racing Championship for the George R. Hinman Trophy. The trophy was donated in recognition of George R. Hinman’s many years of service and contributions to sailing. The 2018 U.S. Team Racing Championship is sponsored by Gill North America and Hobie Polarized.